The long (Memorial Day) weekend was just what we needed around here. Although Memorial Day weekend usually marks the start of summer, vacation and outdoor adventures we needed the exact opposite of all of that. The husband and I played it low key and enjoyed the quiet time together. We tended to our usual errands and we sneaked in some choice foods (of course). Yea, that's how we do tres chic in SF. You look so incredibly chic, what a gorgeous look! we had a low key memorial day as well! all i can really remember are lazy afternoon naps! Love this whole look! You look so chic! Love the stripes and floral mix too. love the whole look. I love the pop of color that your scarf gives. You are so good at the Parisian chic looks Nancy! I love, love this outfit. 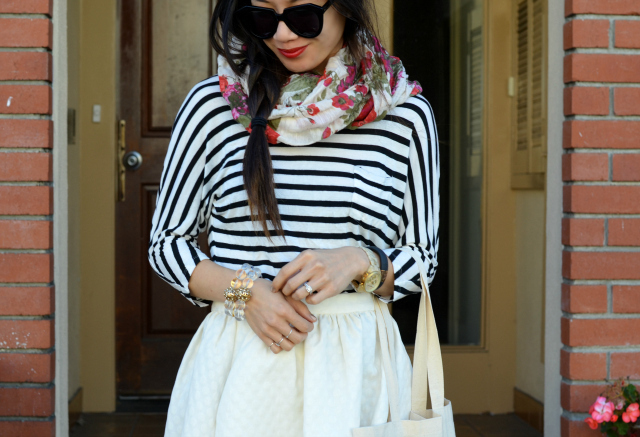 I especially love the floral scarf over the striped shirt! So cute! This look makes me think of a classic Chanel inspiration... Really love it. Chic! Hey lady, hope you had a great holiday weekend. Love the "power clashing" of stripes and floral prints. You look so pretty! Such a chic outfit. We laid low during the holiday as well. Sometimes it's the best way to go. I love your scarf and skirt! I love everything about this outfit, Nancy! 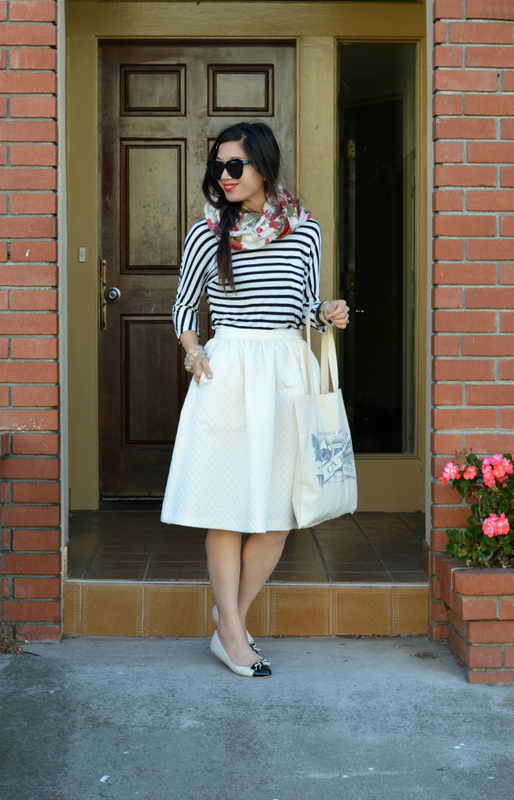 That striped shirt and that full skirt are pure perfection together...and your accessories are spot on! I'm glad to hear you had a nice weekend!! Such a cute outfit - love the look! I am such a sucker for anything and everything striped! Loving those flats! That skirt! You look so uber chic! 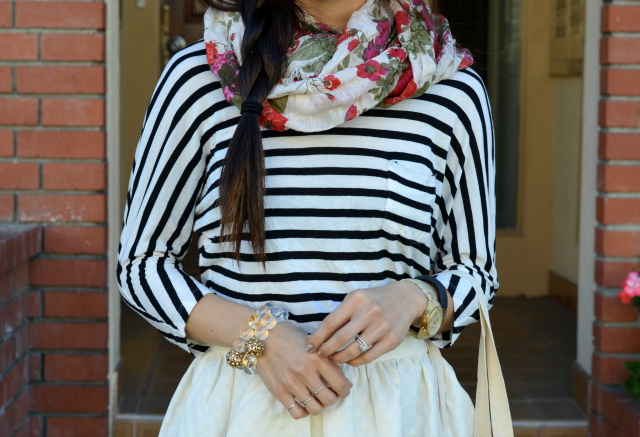 Love the floral scarf on top of the stripes! Lovely! You are always looking tres chic for sure! We didn't do a whole lot either, just had some friends over and bbq & did a little swimming. Weekends like that are the best. Oh, this seems so chic indeed! I love this look! That scarf and the striped top are so cute together! It sounds like you had a great relaxing weekend. 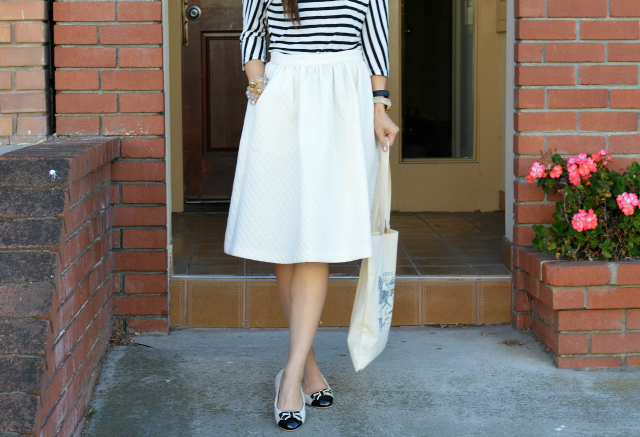 this white skirt is perfect! loving the mix of floral and stripes! so parisian! your owning this skirt, lady! i'm totally pinning this, this is just SO pretty! i love the floral and the stripes. i seriously always forget to wear summer scarves but they make such a difference. Love this look! 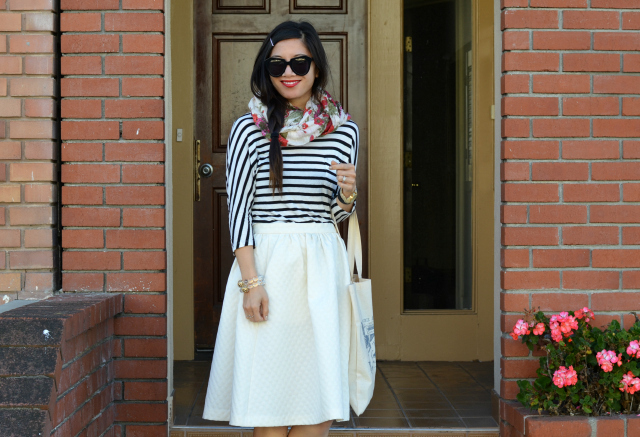 Gorgeous scarf, top, skirt and flats.